Mumps is an acute contagious viral illness, which presents with glandular and/or nervous system involvement. Its common central nervous system (CNS) manifestations include aseptic meningitis and meningoencephalitis. Mumps meningoencephalitis, which is characterized by fever, vomiting, nuchal rigidity, and altered sensorium, usually develops at least 3-10 days after mumps parotitis. While cerebro-spinal fluid (CSF) pleocytosis is present in 65% of mumps cases, only 10% of them developed clinical manifestations. Hydrocephalus secondary to aqueductal stenosis following a mumps meningoencephalitis is an extremely rare occurrence. The present case report is the first case of a hydrocephalus due to aqueductal stenosis as a consequence of mumps meningoencephalitis reported from India. An 8-year-old girl was admitted with the complaints of fever (101-102΀F), vomiting, seizure, and altered sensorium for the last 18 days. The child had not received measles, mumps, and rubella (MMR) vaccination and history of a recent infection with mumps was present. The patients' birth and developmental history was normal and had no significant illnesses in the past. General examination revealed a pulse of 84/min, respiratory rate of 24/min, blood pressure of 120/70 mm of Hg (99 th Percentile) with features of some dehydration. Examination of CNS revealed a Glasgow Coma Scale of 8 (E3V2M3), dilated and sluggishly reacting pupils, increased muscle tone, brisk deep tendon reflexes in all limbs with extensor plantar reflex. She had nuchal rigidity with presence of Kernigs' sign; fundus examination revealed bilateral papilledema. Examination of other systems was unremarkable. Investigation revealed hemoglobin of 12 gm/dl, total leukocyte count of 12,000/mm 3 (Polymorphs 35%, Lymphocytes 52, Monocytes 10), Erythrocyte Sedimentation Rate (ESR) 9, blood sugar 68 mg/dl, serum potassium 3 meq/l, and serum sodium 148 meq/l. Kidney function tests and liver function tests were within normal range. A guarded CSF tap was done after an intra-venous mannitol infusion. CSF cytology revealed 4-5 lymphocyte/mm 3 ; sugar of 107 mg/dl, and protein of 35 mg/ dl. Blood culture and CSF culture were sterile. Mantoux's test, tuberculosis (TB) specific polymerase chain reaction (PCR) in CSF and gastric aspirate for Acid Fast Bacilli (AFB) were negative. Serum anti mumps IgM was positive. Serological studies for Japanese encephalitis virus (JEV) and CSF PCR for enteroviruses were negative. X-ray chest was normal. 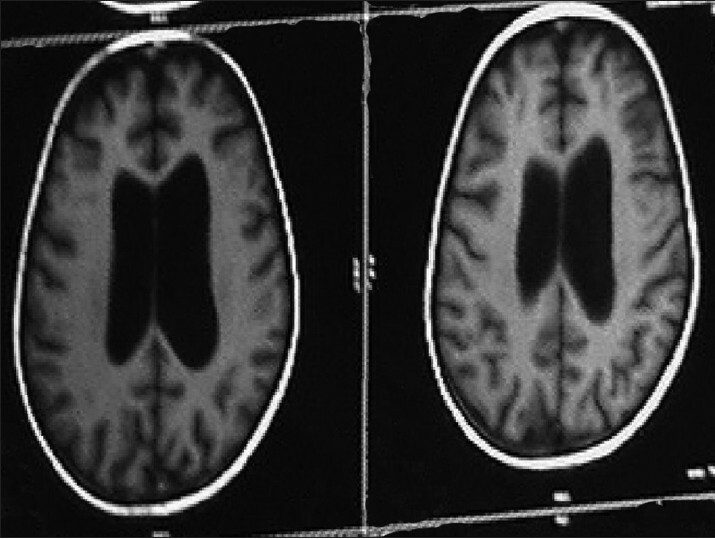 Magnetic resonance imaging of the brain revealed obstructive hydrocephalus with aqueductal stenosis [Figure 1]. On admission, cerebral decongestive therapy (20% mannitol and acetazolamide) was given. Patient was symptomatically managed and his fever and electrolyte imbalance normalized over a period of four days. However, patient still had persistent vomiting, bilateral papilledema, low Glasgow Coma Scale (GCS), and hypertension (99 th centile) even on 10 th day of admission. So a ventriculo-peritoneal shunt surgery was done, the patient improved markedly and was discharged after 12 days of surgery. The patient is doing well and is on regular follow up. Mumps is usually an acute self-limited and contagious infection, caused by a single-stranded pleomorphic ribonucleic acid (RNA) virus belonging to paramyxoviridae family. It has predilection for glandular and nervous tissues. CNS involvement in the form of aseptic meningitis and encephalitis are its usual CNS presentations. Manifestations like meningoencephalitis, orchitis, pancreatitis, and other glandular involvement may or may not be associated with parotitis. In a study by Bang et al.,  62% of mumps cases had an increased number of cells in CSF while only 28% had CNS symptoms. Mumps meningoencephalitis usually follows after 3-10 days of a mumps parotitis, although it may precede or even occur in absence of a glandular involvement. Acute hydrocephalus following mumps meningoencephalitis is very rare. The development of hydrocephalus due to aqueductal stenosis may occur after 1 day to 19 years following onset of mumps encephalitis. However, in our case, aqueductal stenosis developed 3 months after onset of mumps infection. It is most commonly seen in children aged 5-9 years. In 1970, Timmons and Johnson et al., first proved the relationship of mumps virus with hydrocephalus following meningoencephalitis in humans. There are only 19 case reports in the literature reporting relationship between mumps encephalitis and hydrocephalus  and in 16 of these cases hydrocephalus developed secondary to aqueductal stenosis. Only in one of these cases reported by Lahat et al., hydrocephalus developed secondary to obstruction in the foramen of monro. The finding of ependymal cell and cytoplasmatic inclusions of viral nucleocapsid-like material in the CSF of patients with mumps meningitis supports the hypothesis that mumps may cause granular ependymitis and, in rare instances, severe ependyma and subsequent aqueduct occlusion. In absence of successful viral culture, serological markers provide a definitive diagnosis. The serological confirmation is based on detection of virus-specific IgM antibodies measured by enzyme linked immune sorbent assay (ELISA) at an optimal time interval of 7-10 days after the onset of symptom. In our case, the diagnosis of mumps meningoencephalitis was confirmed serologically by ELISA test for mumps specific IgM antibodies. Ventriculoperitoneal and ventriculoatrial shunt are the treatment of choice in acute cases. Percutaneous ventriculostomy from the third ventricle is another treatment modality. Our case responded well to the shunt surgery and is doing well on follow up. Thus, it is concluded that mumps meningoencephalitis is usually a self-limited infection, but may rarely develop serious and fatal complications. Hydrocephalus due to aqueductal stenosis may occur as a result of mumps meningoencephalitis, and hence, emphasizes the importance of mumps vaccination in preventing such rare but serious complication. 1. Gershon AA. Mumps. In: Gershon AA, Hotez PJ, Katz SL, editors. Krugman's Inf Disease of Children. 11 th ed. Pennsylvania: Mosky; 2004. p. 391-402. 2. Cinalli G, Spennato P, Ruggiero C, Aliberti F, Maggi G. Aqueductal stenosis 9 years after mumps meningoencephalitis: Treatment by endoscopic third ventriculostomy. Child Nerv Syst 2004;20:61-4. 3. Bang HO, Bang J. Involement of central nervous system in mumps. Bull Hyg 1944;19:503. 4. Taºtan Y, Cam H, Yilmaz I, Demirel A, Uysal S, Cokuðraþ CH, et al . Reversible acute tetraventricular hydrocephalus complicating possible mumps meningoencephalitis. Pediatr Int 2007;49:100-2. 5. Timmons GD, Johnson KP. Aquecductal stenosis and hydrocephalus after mumps encephalitis. N Engl J Med 1970;283:1505-7. 6. Aydemir C, Eldes N, Kolsal E, Ustundag G, Gul S, Erdem Z. Acute tetraventricular hydrocephalus caused by mumps meningoencephalitis in a child. Pediatr Neurosurg 2009;45:419-21. 7. Lahat E, Aladjem M, Shiffer J, Starinsky R. Hydrocephalus due to bilateral obstruction of the foramen of Monro: A possible late complication of mumps encephalitis. Clin Neurol Neurosurg 1993;95:151-4. 8. Herndon RM, Johnson RT, Davis LE, Descalzi LR. Ependymitis in mumps virus men-ingitis. Electron microscopical studies of cerebrospinal fluid. Arch Neurol 1974;30:475-9. 9. Krause CH, Molyneause PJ, Ho-Yen DO, Mclntyre P, Carman WF, Templeton KE. Comparison of mumps-IgM ELISAs in acute Infection. J Clin Virol 2007;38:153-6.